Home/News/What Makes A Good Mechanic? Great mechanics are able to relate well to customers and listen to them and their needs and concerns. They are able to communicate clearly with them and explain the diagnosis and repair suggestions in easy to understand language. A good mechanic has excellent communication skills and is able to translate complex technical jargon into plain English for the average customer. A great auto mechanic is able to quickly identify the source of a problem and other related issues and potential future ones. He is aware of and has diagnostic resources and equipment to identify vehicle problems. Good mechanics can quickly suggest possible ways of addressing problems and provide solutions. Mechanics should be able to use a variety of technical tools to diagnose and address a wide variety of vehicular problems. Vehicles and technology are continually evolving, and great mechanics stay on top of these changes so they can best serve their customers. As hybrids become more popular, for example, mechanics will be knowledgeable on the most common problems or what could be the most common problems. Mechanics interested in advancing in the profession have savvy leadership skills and are able to take charge when situations warrant. While certification is not a requirement of mechanics, it demonstrates a sense of motivation and ambition to both employers and customers. Certification also ensures that the mechanic is up-to-date on the latest technologies and techniques in the industry. Though not always required of a mechanic, a personal inventory of high-quality tools can ensure that a mechanic feels comfortable using tools, and learning new tools as they become available.. Many mechanics use their own tools on customers’ vehicles. 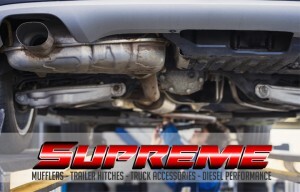 A Supreme Muffler we strive to always be quality mechanics providing the best customer service with top quality products. If you want a local mechanic you can count on, call Supreme Muffler at 504-885-5950.